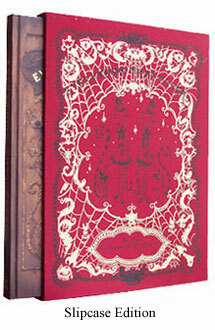 The first collected work of Elizabeth McGrath. 112 pages of full-color photos and detail shots. Hardbound with a circular die cut window and gold embossed lettering. Signed and numbered limited edition of 200. 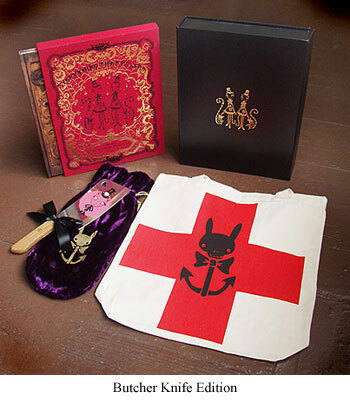 Comes with gold and black embossed cloth covered slipcase, black with gold embossed clamshell case cover, screened butcher knife in velvet anchor bunny bag and and anchor bunny canvas tote. Published by La Luz de Jesus Press & Last Gasp. Visit prints & books to view all La Luz de Jesus Press titles. 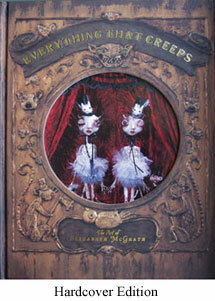 New Elizabeth McGrath print also available. Click here for more information.